Guru MWG Barbless This is an awesome, strong all-round pattern that’s suitable for most styles of angling, right from waggler fishing, through to heavy pole work and specialist feeder fishing. It’s a more conventional pattern than the QM1 and features a super-wide gape that helps you to connect with as many bites as possible. 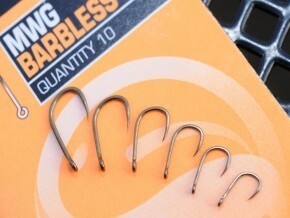 The beaked shape will help convert solid hook holds into fish in the net. A large eye allows you to thread heavier hook link lines through three times when tying the knotless knot for the most cutting-edge hair-rig presentations. As with the QM1, the MWG is available in sizes 10,12, 14, 16, 18 and 20 and are supplied in packs of 10.